Drive competitive advantage, control costs, and manage business risk by leveraging proven cloud platforms and technologies. Clients are demanding more from IT - faster time to market, new applications and technologies, and more agility. Cloud computing can help you exceed their expectations. Rapid access to computing resources allowing you to scale up or down, while still controlling costs. Deploying and running applications in a cloud computing environment can be a key enabler for business agility. By leveraging a cloud platform, you can focus on your core competencies, and use your resources and skills to drive innovation for your business. According to IDC, "Businesses now think 'cloud first' when it comes to their IT strategy and software footprint, since the benefits of cloud are clear and have been broadly demonstrated in most industries." 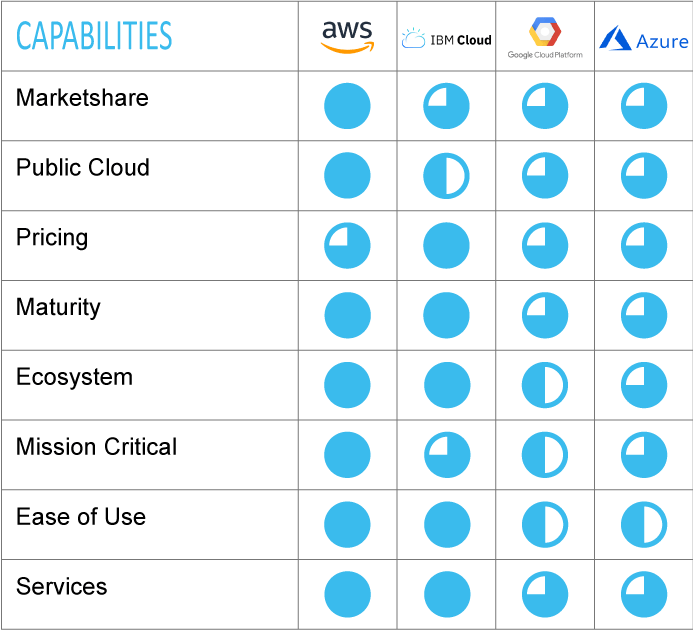 Gartner finds AWS and Microsoft the leaders in IaaS services, and IBM a leader in data center outsourcing and infrastructure utility services in North America. Alacrinet works with the industry leading cloud platform providers. Whether your solution will run on public, private, or hybrid cloud platforms, Alacrinet will work with you to deliver solutions that best fits your IT and business strategy. Amazon Web Services (AWS) provides a mature and robust cloud platform offering advanced security, network, and hybrid integration capabilities. AWS provides a secured, reliable global infrastructure so you can deploy your applications and data where your customers reside. In addition, AWS offered a strong track record in operational excellence and service innovation. IBM Cloud - Available in nearly 60 data centers worldwide (and your own), IBM Cloud is a best-in-class cloud solution for your business today. It provides an integrated infrastructure, managed by a single system for an untouchable level of automation. IBM Cloud is built on the worlds most popular open source projects to enables developers to build and run modern apps and services. IBM Cloud offers application computing as flexible as your business needs and facilitates architectural and development strategies that make existing on-premises applications work with new applications developed in the cloud. Google Cloud Platform (GCP) offers a full spectrum of cloud products and services for compute, storage, networking, big data, machine learning, operations, and more. With GCP you can build, test, and deploy applications on Google's secure, highly-scalable, reliable, and cost effective infrastructure for your web, mobile, and backend solutions. For over ten years, Google has been building some of the most efficient data centers in the world. Microsoft Azure is an open, flexible, enterprise-grade cloud computing platform. Azure is a comprehensive set of cloud services that developers and IT professionals use to build, deploy, and manage applications through Microsoft's global network of data centers. Azure provides integrated tools, DevOps, and marketplace support to efficiently build anything from simple mobile apps to internet-scale solutions. Alacrinet will work with you to identify the best solutions for your environment, whether it's on-premise or in a co-location facility, for these offerings and more. Contact us for more information on moving and running your applications in the cloud.